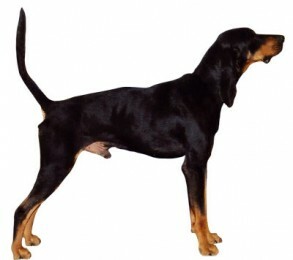 COLOR(S): Black with tan markings. The Chihuahua is the smallest breed of dog in the world; it was named after the state of Chihuahua in Mexico. The Chihuahua is a graceful, alert, swift-moving little dog with saucy expression, compact, and with terrier-like qualities of temperament. It is a strong-willed, intensely loyal dog breed. It becomes very attached to its owners, even to the point of jealousy. There are two distinct breed types, one with a long coat of soft texture, the other with a short coat. Identical otherwise, both can be whelped in the same litter. Adored for its small size, the Chihuahua is a bright eyed, dainty dog. It is perfect for apartment living. The Chihuahua is courageous, extremely lively, proud and enterprising, it gives and demands affection. It likes to lick its owner's faces. It is undeniably suspicious of strangers. When strangers are present, it follows its owner's every move, keeping as close as possible. This breed may snap at teasing children; it is not recommended for children. The Chihuahua must resort to his sharp teeth in self-defense. Socialization as a puppy is a must to avoid excessive aggressiveness with other dogs as well as reserve with strangers. It may be slightly difficult to train, but it is intelligent, learns quickly, and responds well to proper, gentle training. It can be noisy and may require patience to housebreak. It tends to be fairly dog aggressive. It makes a very good watchdog. The Chihuahua requires minimal grooming. The Smooth coat variety requires only occasional brushing. The Long coat variety should be brushed several times a week with a soft bristle brush. Both varieties only need bathing once a month using a mild shampoo. Special care must be given to not get water into their ears as they are prone to ear infections. Dental hygiene is a must to prevent tooth loss. The health issues that affect this breed include slipped stifles, open font or soft spot, eye problems, and heart disease. The Chihuahua does not tolerate cold climates and must be protected when taken outside. Collapsing trachea. heart problems, hydrocephallic, and patellar luxation. Other health concerns include eye problems and hypoglycemia. Chihuahuas are very fragile dogs whose bones can break easily.